The Duchy of Lancaster has lent its support to a new fundraising campaign which hopes to raise over £15m for armed forces and mental health charities. 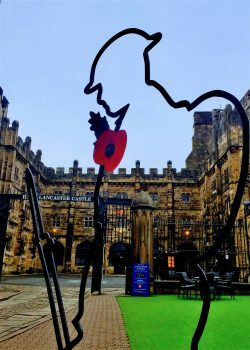 The ‘There But Not There’ campaign launched this month will see the installation of life-sized ‘cut-out’ sculptures of WWI soldiers in iconic locations across the UK – and one of the first to be unveiled is at Lancaster Castle. The six-foot-high ‘Tommies’ are part of a nationwide art installation marking the centenary of the end of the First World War. The figures first captured the public’s attention when they were revealed at the Tower of London, the Giants Causeway in Northern Ireland, Big Pit National Coal Museum in Wales and Heart of Midlothian Football Club in Scotland earlier this year. Alongside the standing figures placed in high profile public locations, local community groups, such as schools, businesses, places of worship and village halls will be given the opportunity to host their own ‘silhouette installations’. These silhouettes, which are different in shape to the standing Tommy, are designed to fit into seated spaces and were inspired by an art installation created by Martin Barraud at Penshurst Church in Kent in 2016. Those who wish to support the charity in remembering the fallen will be able to purchase smaller commemorative figures available online. At the end of the campaign, all monies raised will be distributed evenly between The Royal Foundation: Heads Together, Walking With The Wounded, Combat Stress, Help for Heroes: Hidden Wounds, The Commonwealth War Graves Foundation and Project Equinox: Housing Veterans.